By Susan Tretakis – It’s funny – in a sad kind of way – how IBS sufferers share certain traits. We’re the ones who, upon entering any new venue – be it a restaurant, lecture hall, gym, even a doctors’ office – automatically ascertain where the restrooms are. We’re the ones who casually ask, when invited to an art show, is it outside or indoors? Outside usually means a “porta-potty” and for us – because that is simply not an option – we politely decline the invitation. We’re the ones who – when invited on a “road trip” – however much we want to go – need to first check our comfort level with the driver. How much do we want to confide about our need for possible pit stops? How comfortable do we feel about discussing – in spite of all the current television ads with catchy jingles – about stomach cramping, excess gas, explosive diarrhea alternating with bouts of constipation? We’re between the five and 40 percent of Americans who suffer from irritable bowel syndrome (IBS). Some of us have minor symptoms while for others the symptoms are significant enough to disrupt their lives. We know that beyond a doubt, whether we were diagnosed with a “spastic colon”, an “irritable colon” or “spastic colitis”, we are held hostage by a group of intestinal symptoms that usually occur together. Western medicine tends to treat IBS with pills for each symptom; one medication for gas, another for diarrhea, yet another for constipation. Doctors encourage good eating habits and advise you not to stress – somewhat difficult when our lives are so busy and the illness itself causes great stress. Try “not stressing” as you need to excuse yourself from an important presentation you’re giving to six supervisors as you trot/waddle toward the nearest restroom. Westerners need to understand that in Traditional Chinese Medicine an organ, be it the spleen, liver, kidney or large intestine, are all parts of a set that function together. Each organ has a specific meridian coming from it that connects with a paired organ as well as to various parts of the body. It doesn’t mean there is damage to a particular organ; it simply refers to a disruption, a blockage of ‘Qi’, which causes a disharmony. IBS is a complicated illness, and as such, Traditional Chinese Medicine, with its “no one size treatment for all” seems to make more sense than current drug therapy. Taking pills may cause a need for other ones because so many medications have just as debilitating side effects. In fact, research shows that two of the most popular prescriptive medications for IBS – Alosetrom Hydrochloride for diarrhea and Tegaserod Maleate for constipation – have serious side effects. This is the same self-medicating game we play ourselves when we carry our Immodium with ExLax – “just in case”. TCM uses acupuncture to balance your system from within by selecting certain acupuncture points along the meridians of the stomach and large intestine. What’s somewhat confusing to someone first experiencing acupuncture is that these points are usually located along the lateral side of the legs and arms. While these points will cause IBS symptoms to lessen, reinforcement techniques can be used to strengthen the body’s immune system. Traditional Chinese Medicine teaches you to identify and address the underlying causes of digestive problems. It becomes obvious that the function of ones’ digestive system has a great deal to do with what you put into your mouth. TCM teaches you something I call “body awareness” and to be selective about what you eat and drink. More than being just told to “eat smart”, TCM has identified that sugar, caffeine, alcohol and fried or processed foods impede digestion. Naturopaths will advise you to keep fluids with meals to a minimum, and to chew food thoroughly. The natural process by which saliva is added to food as it is chewed, to break it down thoroughly in the mouth, sets the rest of the digestive process in motion. Our habit of washing down food with water or other beverages turns out to be counter-productive. Fluids may also dilute stomach acid, making digestion less efficient. 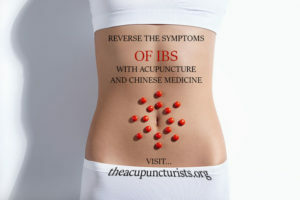 Another important piece of TCM treatment for IBS is the use of Chinese herbs. In Chinese herbology, a group of herbs is combined to specifically address ones unique constitution. A board-certified master herbalist will treat no two patients with the same combination of herbs. Research has shown that patients who receive individually customized herbal formulas had more success in controlling IBS symptoms. Think of this the next time you see a television commercial touting the next new wonder drug for digestion issues; I promise you that as we head into the holiday season, these advertisements will become more and more frequent. Studies of people with IBS were over 50% more likely to have an anxiety disorder and over 70% more likely to have a mood disorder such as depression. Another study compared the level of the stress hormone cortisol in patients with and without IBS. Given a public speaking task, those with IBS experienced greater changes in cortisol, suggesting greater stress levels. More than one study has investigated the use of acupuncture in IBS patients and has found that patients’ quality of life has greatly improved, both in terms of abdominal pain and in a significant reduction in stress. The conclusions drawn – and repeated throughout numerous studies – is that acupuncture is an effective form of treatment for IBS, particularly the pain and stress symptoms. Whichever comes first, anxiety and digestive IBS symptoms reinforce one another in a vicious cycle. While it is unclear whether IBS symptoms are an expression of mental stress or if it is the stress of living with IBS that makes people more prone to psychological difficulties, we know that Acupuncture has a proven track record for controlling stress. Adding in meditation, exercise, dietary education and calming visualizations can benefit many sufferers. Here’s what I know: while Acupuncture, Traditional Chinese Medicine and Chinese Herbs may be dismissed by some Western doctors and scientists who question the concept of ‘Qi”, I know my attacks are few and far in between. While I find it gratifying to see more and more Western Doctors looking to complementary and alternative health practices, I am more than willing to give the benefit of doubt to both my Acupuncturist and his herbs. My former general practitioner told me that my IBS was a chronic condition, one that that I simply need to endure. Traditional Chinese Medicine and Acupuncture changed that and for me, what matters most are results. The fact that I just tossed boxes of both Imodium and Ex-lax into the garbage because the expiration date was six months ago speaks volumes. Learn more about Acupuncture and Digestion. The Acupuncturists proudly serve the cities of Margate, Coconut Creek and Coral Springs Florida and offer free consultations daily.